Sister Trai Nghiem is a nun at the Plum Village. She was ordained in 2009 as part of the Pink Lotus ordination family. 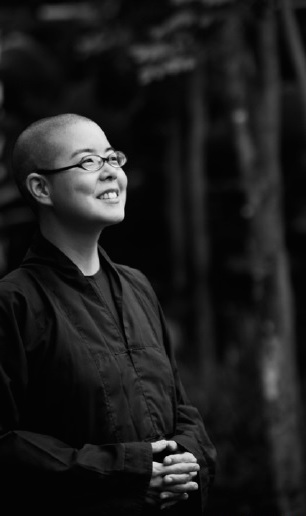 Sister Trai Nghiem will be part of our 2015 Fall Tour of the United States. TN: Not immediately… but then I realized that this was my practice and saw that I needed to practice letting go of my judgmental, analytical, and cynical mind in order to just enjoy the present moment. Today I realize that the practice songs are one of the most clever methods of practice in our tradition. The moment I find myself in a foul mood, a song like “Happiness” comes to my rescue. Because we sing the songs every day, they are embedded in our store consciousness and become available whenever we are carried away in forgetfulness. Knowing their powerful “medicinal” effect, now I sing songs wholeheartedly with the gestures and everything. I’m 47 yrs old female had many life experiences always working to set example to others ln truth love and kindness. I’m on a similar journey of letting go of everything and now im off to Bali in 5 weeks to seek a higher level of spiritual awareness I have researched Plumb Village and would love to Visit . I’m also contemplating of what it means to be a nun. Therefore j would like to work as a novice at plumb village for the experience and develop a deeper understanding. Thank you so much it’s a wonderful Very inspirational story . The monastics don’t monitor this site much, ,but I do know a good place to begin is to plan a visit to Plum Village and see if you like it. Last night I emailed Plum Village about volunteering as they are still need the help. dear sister TN….thank you for your honest sharing of your path as a monastic… i’ve had the pleasure of being with you, enjoying your music, and even taking tea time in your quarter during our VN New Year Celebration… i love the part of taking refuge in your parents… i know about that as i am much closer to my father for i feel our inter-being much more now than ever before… thank you dear sister, and i look forward to sharing a hug in person soon…. a lotus to you. Wonderful, so enjoyed your interview. I practiced a mantra “There is enough, you have enough, you are enough” for a year to practice non-consumerism.